Supervisory Officers have the opportunity to apply for one (1) of the two (2) Awards available through the Local Government Supervisors Association (L.G.S.A.) of Western Australia Inc. by completing the appropriate application form attached. Applicants are encouraged to ensure that all the information requested in the application form is provided in total, together with any other relevant information in support of the application (it is advisable to keep a copy of your application). The success of each application will be judged on the appropriateness of the information supplied, the proposed achievement and reasons for applying for the award of the individual. The applications will be judged by a Committee set up specifically for this Award and the winners will be announced at the Annual Conference Dinner. All applicants are encouraged to discuss their applications with their Senior Officer, to obtain the necessary agreement, support and encouragement to submit their application. While the value of the Award will be up to $1500.00 for financial members of the Association, and up to $600.00 for non-members, it is to be used towards the cost of travelling, accommodation including meals, course fees, or conference costs, which ever is relevant. The amount may not be sufficient to cover the total cost of the educational proposal submitted, and the support of the applicant’s Municipality may be necessary for any shortfall in this area. The successful applicants granted an award in any year, will need to keep all receipts and records of any areas in which the money had been expended and upon completion of the applicants programme, all receipts or excess money will need to be sent to the Association for its financial records. Award proposals are expected to be of short duration to minimise intrusion into normal working time. It is envisaged that training programmes will not exceed one week and host/exchange programmes will not exceed two weeks. Attendance at an approved training course. Attendance at an approved conference within Australia. ‘Host or Exchange’ for a minimum period of one week with a Supervisor either from Intrastate or Interstate. A combination of any of the above, or any other proposals. Training programmes and conferences should be targeted towards enhancement of the applicant’s career. 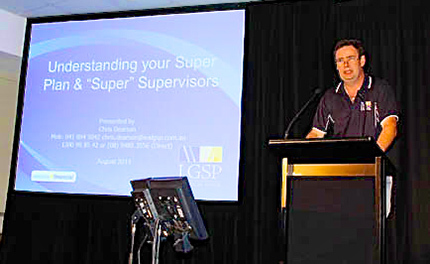 It should be noted that in this context, there are several organisations that provide a number of courses specifically aimed at increasing the skills of Supervisory Officers. There may be others offering similar criteria that you may consider worthy. In any event the intending award applicants would be wise to assess all/any areas prior to finalising their application. Also, it will be necessary to include the course contents, outcomes and resultant benefits with the application, for assessment by the committee. Applicants for a ‘Host’ or ‘Exchange’ programme will be expected to make contact and tentative arrangements made with the intended host council or authority prior to submitting a ‘Host’ or ‘Exchange’ programme application. It is envisaged that a successful applicant for an ‘Exchange’ programme will be actively involved in a supervisory role with a host municipality or authority. Ideally, but not necessarily, they will exchange jobs with a counterpart in a host organisation. In any event, the exchange applicant will be expected to trade skills and techniques with management in the host organisation. Applicants for the exchange programmes should identify one or two ‘Key Issues’ to be studied i.e. their primary interests. Issues identified at some past conference may be worthy of consideration. As part of the application, it is envisaged that the successful applicant/s will present a report at the following year’s Annual State Supervisors Conference.